FAYETTEVILLE, N.C. – October 19th: the Opening Game of the second season for the Fayetteville Marksmen. With 56 games on the schedule, the Marksmen didn’t want the season to end when the schedule said it would. With a 25-23-8 record (more than double the wins of last year’s team), Fayetteville earned themselves a spot in the playoffs. Their opponent – the Birmingham Bulls – took the Marksmen with the second selection in the Challenge Round. Every game from now on is earned, not given, and the Marksmen know that. They don’t plan on laying down and giving up to a previously-superior Birmingham squad. The series opens tonight with the first playoff game in Marksmen history at the Crown. They look to avenge their 0-4 regular season record against the Bulls. It’s a new season, and the slate is wiped. Fayetteville didn’t perform too well against these Bulls in the regular season, losing all four contests. The Marksmen were outscored 21-6 in the four games, scoring two goals three times and getting shut-out once. Scoring was no issue for Birmingham, scoring five-goals three times, and six in the other game against Fayetteville. In a best-of-three series, every game is important. No games can be taken off in a quick in-and-out trio like the SPHL set up here. The most important game for the Marksmen, and for the series, is the first one. It’s much easier to take a lead into Pelham, than having to win two in a row to keep the season alive. Playing perfect is near impossible, but that’s what you have to do when you only get a trio of games. Fayetteville proved last weekend the adage that’s been preached all season: special teams is key to winning big games. In last Friday’s match-up against Huntsville, the Marksmen controlled the special teams portion of the game, killing all five of the Havoc power plays, and going 1/3 with the advantage. Fayetteville finished the season first in the league on the power play, a full percentage point above second. Birmingham is coming into this series hot, winning seven in a row before dropping their final regular-season contest. The Bulls finished in second place, just ahead of third-place Huntsville (despite Huntsville winning the Battle of Alabama). Following a bad-debut in 2017 (Ninth Place), Birmingham came out of the gate hot, winning their first 11 games. They sat in the catbird seat all year and never held back, gliding into second place. The Marksmen are coming into this series just the opposite of the Bulls. The Marksmen have lost five of their final six games in the regular season. They dropped a pair of games to both Huntsville and Birmingham as well as a game to Roanoke in the final six. Fayetteville has been a very streaky team all season, as they’ve had long streaks of both wins and losses. 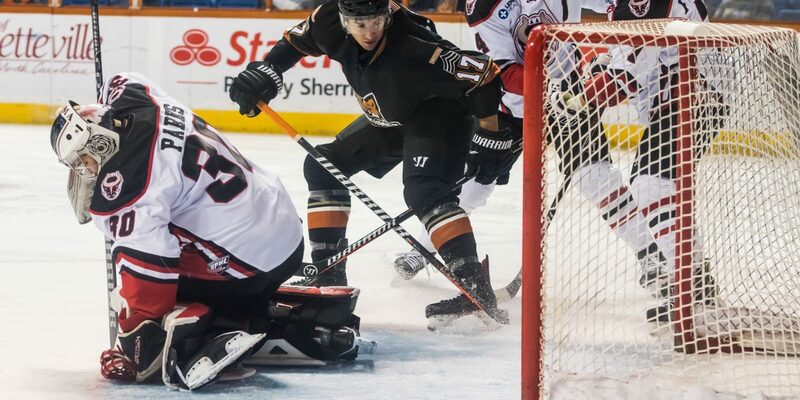 The Marksmen had the third longest win streak in the league this season at eight, but also had the fourth longest losing streak at five games. Streaks can help a team, and the Marksmen may need a good streak to help them get past Birmingham. The late-season skid could prove costly for the Marksmen as they ended up with the eight seed in the playoffs. Once the first round is over, the lowest remaining seed has to play the highest remaining seed. Since the Marksmen failed to win in the late season games, they could be at more of a disadvantage in their second round games than they would have been as a five or six. Facing adversity will be a regular thing for the Marksmen in the postseason, and they need to get used to it. With the amount of goals that the Marksmen know that Birmingham can score, goal-tending will be at the forefront of the series. Dillon Kelley will presumably be the starter in the first round, but Jason Pawloski showed to be a reliable option in the Friday win. For Fayetteville to do well and upset the bulls, they need to not give up a five spot every game. For a team that may not light it up on the offensive end, goal-tending is even more important. Playing in the postseason for any sport is a privilege, and not to be taken lightly. Every game from here on out is earned; no team will be given anything. The puck drops Friday on the first ever opportunity to play for a chance at the President’s Cup. Winning is a must, even in the ugliest, dirtiest ways. Once that clock hits zero, you better make sure the number on your side is bigger. The most important games in the short history of the Marksmen happen on Friday and Saturday, against their toughest opponent this season. The whole year has worked up to this point. Tickets are $10, Rinkside seats are $20, and following the conclusion of the game, join us in the Fox Hole Suite for our $5 Post-Game Skate, and Game-Worn White Jerseys will be AUCTIONED-OFF! Won jerseys will be autographed and given to winners after the conclusion of the season. The Marksmen have clinched a spot in the SPHL Post-Season for the first time in Team History – and we want you here TONIGHT with $10 tickets!